Since Little Valley Piano was founded, we have based our actions on integrity and trust. If you are not completely satisfied for any reason , whether it is tuning, regulation, or a repair we perform that fails before its appointed time – Little Valley Piano will return free of charge. 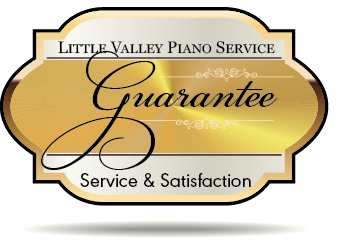 That’s the Little Valley Piano Service Satisfaction Guarantee! Our guarantee applies to our work while we are working on your piano, and long after we leave. If at any point you are not happy, we promise to resolve the issue to your complete satisfaction, or provide you with a full refund. Schedule your next piano service today and experience the peace of mind that comes with A Little Valley Piano Tuning for yourself.